~~Meets 1st Sat (except July-Aug) 1 pm at the Spokane Public Library (Downtown Branch), 1st Floor Conference Room, 906 W Main Ave, Spokane. The Genealogy Room of EWGS is housed on the 2nd floor of the Spokane Public Library, 906 W. Main St, Spokane, WA. The "Genie Room" is open to the public for research during library hours, 10am-6pm on Monday, Thursday, Friday & Saturday and 10am-8pm on Tuesday & Wednesday. Members of EWGS provide research assistance on Tuesdays, 10am-12pm and 1pm-3pm or by appointment. EWGS provides a number of special interest groups. Some seminars are held at locations other then the library, see website for details. Special Collections include; Surname indexes, Cemetery records and obituaries. Check out the Tombstone Tales on the website.​ EWGS is a WA Non-Profit Corp. Service area includes Spokane and Lincoln Counties and the communities of; Spokane, Deer Park, Rockford, Latah, Spangle, Plaza, Cheney, Airway Heights, Tyler, Sprague, Harrington, Mohler, Odessa, Davenport, Creston and Almira. ~~Meets 2nd Wednesday of the month, 1pm, in the meeting room of the Family History Center in the basement of the LDS (Mormon) Church, 260 E. Juniper St., Colville, WA. NE WA Gen. Soc. 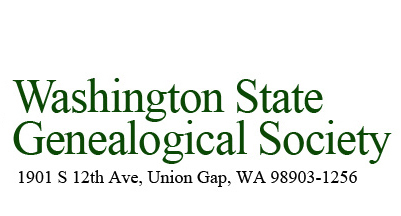 is a WA Non-Profit Corp. Their genealogical collection is located at the Colville Public Library, 195 S. Oak St. An online catalog of their holdings is available on the website. Special Collections include; Burials in the Evergreen, Highland and Mountain View Cemeteries, published local area histories and local newspapers. Service area includes Stevens, Ferry and Pend Oreille Counties and the communities of Addy, Chewelah, Colville, Curlew, Cusick, Fruitland, Gifford, Ione, Keller, Kettle Falls, Kewa, Laurier, Marble, Metalline Falls, Newport, Northport, Republic, Rice, Ruby, Wellpinit and the Colville Indian Reservation.